Sheer and beautifully glossy pantyhose made with 3D Lycra. Don't panic when you see slightly fuzzy fabric in the packet - you need to put them on to see the shine! The high content of elastane will ensure that they fit like a glove. Sheer to waist, totally invisible/summer toes, flat seams, cotton gusset, back panel in size 5. Sheer and beautifully glossy pantyhose made with 3D Lycra. Don't panic when you see slightly fuzzy fabric in the packet - you need to put them on to see the shine! The high content of elastane will ensure that they fit like a glove and add durability. Main features: sheer to waist, totally invisible/summer toes, flat seams, cotton gusset, back panel in size 5. Cecilia de Rafael Sevilla are my favorite pantyhose. 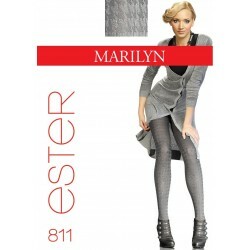 The hosiery is wonderfully soft making it a delight to wear. The glossy yarn adds a beautiful shimmer to your legs. The pantyhose stretches well without running, providing a durable and excellent fit. A perfectly fitting pair of hose that adjusts to any shape. Can be worn high or low on the hips without them sliding down and bagging at the crotch. They create an absolutely stunning, even-colored glass-like appearance on your legs with absolutely no visible weave at all! Never worn anything like them. Nice glide under pants but these are too remarkable to wear covered up. Save that for Wal-Mart brands. They feel wonderful on your legs!! In shorts, there is little chance that your legs will go unadmired, so guys wanting to wear stealthily may want to avoid these. If you are a confident male hose wearer wanting to push the envelope of noticeability then these are AWESOME!